Sigenics, Inc. is in the business of designing and manufacturing electronic and microelectronic devices for a variety of applications. Most of the integrated circuits we have developed use silicon wafers as a basis for testing electronic device capabilities. What is a Silicon Wafer? A silicon wafer is a thin slice of pure silicon, typically manufactured so that the entire wafer is cut from a single, highly purified crystal of silicon. Silicon wafers are used as the basic material for manufacturing microelectronic devices (i.e. silicon microchips). Most electronic devices are made from silicon, using silicon wafers as the starting material. Electronic devices such as phones, computers, camera sensors, microwave oven control panels, hearing aids, credit card security chips, WiFi boxes, MP3 players, solar cells, and memory sticks are all made using microchips cut from silicon wafers. All of these different functions are made by printing different patterns of circuitry on the silicon. How are Silicon Wafers Manufactured? 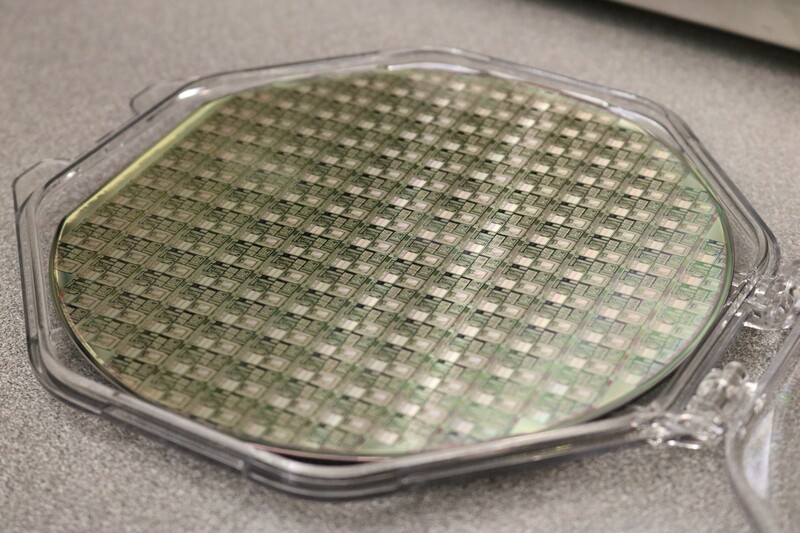 Silicon wafers are manufactured in various sizes, ranging from 50mm diameter for some specialty items, to 300mm diameter wafers used for manufacturing large quantities of digital memory chips and microprocessor chips. Steps A-D are the manufacturing of the blank silicon wafer. Steps E-F convert a blank wafer into a finished wafer full of microelectronic devices. Steps G, H, and I are "back end" processing to convert a finished wafer into useful electronic components. Refine pure elemental silicon from ordinary sand (which is mostly silicon dioxide, also called "silica"). Melt and carefully re-crystallize the silicon to form a large single crystal, usually in a cylindrical shape like a large salami. Cut slices from the large crystal; these slices are blank, rough-cut silicon wafers. Polish the surface of each silicon wafer. Print circuit patterns on the polished wafer surface to make microelectronic devices. Usually this printing process involves many steps in which different layers are stacked up on the silicon wafer surface, each layer with a different pattern, so the final result can be a complex design of electronic components and interconnecting wires. This printing process is usually called "microlithography." A complete microelectronic device is usually much smaller than an entire silicon wafer. During the printing process, many copies of the microelectronic device are printed in a regular array on the silicon wafer. After the printing is finished, the wafer is inspected for flaws, and each copy of the microelectronic device is electrically tested to check for flaws or malfunction. Faulty copies are noted on a map, and sometimes these faulty copies are also marked with an ink dot. The wafer is then sawed apart to separate the individual copies of the microelectronic device. Although each individual wafer piece is called a "chip,” the wafer cutting process is done very carefully, and no chisels are involved. This process of cutting a wafer into many chips is often called dicing, and the chips are usually rectangular. The final stage of manufacturing a microchip is to put the silicon chip inside some type of protective package, usually made of plastic or ceramic, with metal terminals for electrical connections to the chip. How Much Does a Wafer of Silicon Cost? A raw, un-polished, blank silicon wafer may cost anywhere from $5 to $500, depending on the size, purity, and crystal lattice orientation. A finished printed wafer may cost anywhere from $500 to $50,000, depending on the wafer size and the complexity of the lithography process used to print on it. Why Are Silicon Wafers Important? Silicon wafers are the basic material used for manufacturing almost all electronic devices. The list above is just a small sample of all the things that are made from silicon wafers. The most common silicon wafers currently manufactured are some of the purest material ever made. An ordinary silicon wafer has few flaws, and such perfect purity, that it makes the finest diamond jewels look dirty by comparison. Silicon is transparent to infrared light, and polished silicon wafers are sometimes used as protective windows for thermal cameras. When silicon reacts with oxygen, it forms silicon dioxide, which is the basic material of glass, sand, and quartz. During the manufacturing process for making microchips, an insulating layer can be added to a silicon wafer by simply baking the wafer in hot air, so the surface reacts with oxygen to form a thin layer of glass. The fact that silicon is a semiconductor and silicon dioxide is an excellent electrical insulator is part of what makes silicon such a useful material for making electronic devices. For more information regarding silicon wafers, please email us at customchips@sigenics.com.